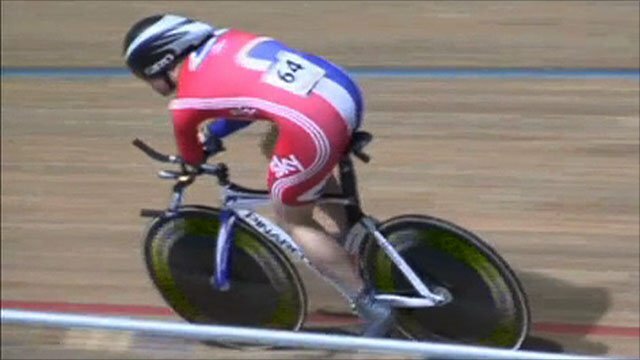 War veterans Jon-Allen Butterworth and Terry Byrne won medals in their first major event, at the World Track Para-Cycling Championships in Italy. Butterworth, 25, set a new world record in winning the 1km time trial (C5) in one minute, 7.615 seconds. Byrne, 26, finished second in the 1km time trial (C4) behind team-mate Jody Cundy, who broke his own world record. Darren Kenny added kilo gold (C3) to his win in Friday's pursuit, as Sarah Storey clinched the C5 pursuit title. Butterworth and Bryne are the first athletes to come through the Battle Back programme, which helps wounded service personnel. Butterworth lost his left arm in a rocket attack on Basra Air Station in Iraq in August 2007, while Byrne had a below-knee amputation after being injured on night patrol in Afghanistan in 2008. Byrne took silver in Italy with a time of one minute 7.694 seconds before Cundy beat his own 2009 record with a time of one minute 5.144 seconds. Competing in a different disability category, former RAF weapons technician Butterworth, who had already set a new British record in Italy after finishing sixth in the individual pursuit on Friday, beat team-mate Mark Bristow's 2009 world record as he stormed to first place in the time trial. Kenny had been joined on the podium by Great Britain team-mates Rik Waddon and Shaun McKeown on Friday and the trio almost made it a second successive clean sweep. Rik Waddon took silver, 0.440 seconds off Kenny's winning time of 1:11.293 seconds but McKeown saw bronze snatched from him by a surge from Spain's Amador Granados. Storey breezed through the quarter-finals of the women's pursuit and before reeling in Greta Neimanas of the United States in a ride-off for gold. The event in Italy is one of only two opportunities for track riders to earn qualification points to gain team places at the 2012 Paralympic Games in London.